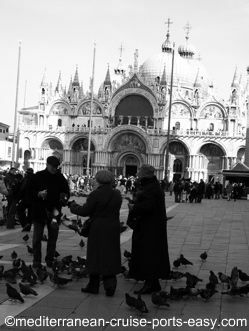 Basilica di San Marco is placed right downtown Venice, in St. Mark's square. You'll easily recognize it if you approach Venice by water, by its big cupolas. You can walk Venice from the cruise ship terminal (about 60 minutes) but also cut your trip a bit shorter if you use the new Venice people mover. 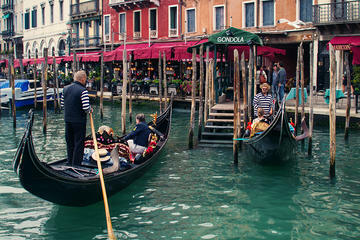 If you are staying in Venice after your cruise and want to see the basilica after dropping your luggage off at the hotel check the Viator's water taxi boat transport in Venice for a hassle free delivery to the Hotels in Venice. 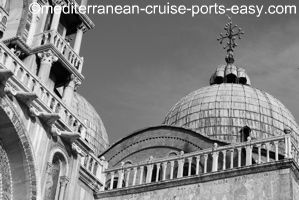 Being a cruise ship passenger, with only a day or two in Venice, you may be a bit limited with time. take an hour of time and see it from the inside too. 1. Length of the line - there always is one. Especially if you're visiting in high season (April to October). Sometimes going as far as the middle of the Piazzetta San Marco. Except maybe very very early in the morning. An average wait is about 15 minutes. 2. Whether you only want to visit the free-of-charge part of the church – the main part of the church where you will see the mosaics and marble floors. 3. Or… you want to visit the 3 different museums inside. There will be a couple of Euro charge to enter each one of them. 4. 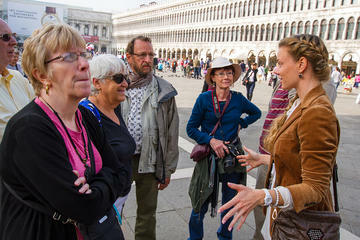 You really want to learn all you can from a professional guide and book one of the Viator Basilica di San Marco Tours online. In high season, from April 1st to October 31st, it is possible to pre-book your entrance to Basilica di San Marco. Know your exact time of visit (take into account your possible cruise line shore excursions on that day, their duration time and place of drop off), how many people will be joining you and pre-book your visit here. Reservations can be made up to 10 minutes ahead of your visit. 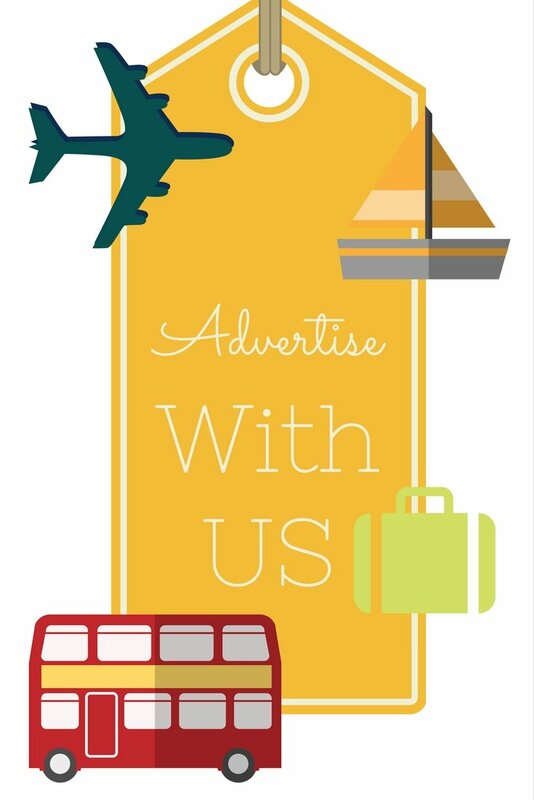 You can book for up to 5 people. If there's more people in your party, simply make multiple bookings. There is a € 2,00 fee for this service for each ticket and €0,70 per ticket for Religious Groups and Organized Tours. Print out your voucher and present it at the door of Saint Pietro, which is just to the left from the main entrance to the Basilica. Officially, you are only allowed to visit the Basilica for 10 minutes with the pre-booking voucher but no-one has ever been kicked out for going over that time, so consider it just a tip, not a severely enforced rule. You cannot enter with big pieces of luggage/backpacks – it is very unlikely you'll have any, as a cruise ship passenger. But, if you happen to have any with you, make sure you check it in first before standing in line for 15 minutes for nothing! The bag check is in a different location, Ateneo S. Basso. Standing facing the Basilica San Marco, go round its left corner, across the piazzetta with the lion statue, and then first street to the left, Calle San Basso 315A. 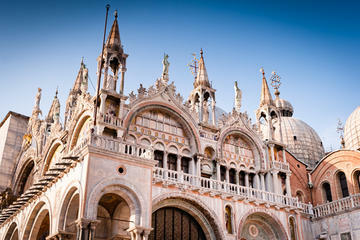 You can read more about St. Mark's Basilica on the Basilica di San Marco official website. 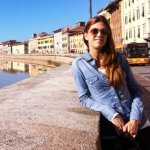 Highlights: Seeing all the Venice attractions in one day, small intimate groups, all the tickets and a gondola ride included!!! 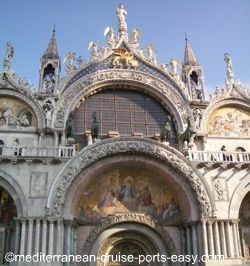 Like Basilica di San Marco Page?